In the arms race to sell more guitars, and a time amplified guitars were only emerging, size mattered. And the Bronson jumbo from the mid-thirties was at the top of the heap at a whopping 16 1/2" across at the lower bout, and 4 5/8" in depth at the end pin. Its art deco influences are revealed in the copious use of abalone, engraved position markers and tastefully adorned head stock overlay. The bound top is a dark mahogany stained spruce, and ladder braced. Back and sides are a straight grained rosewood which, upon close inspection, appears to be solid. The bridge is rosewood with a compensated saddle, and, along with the pins, appears original. 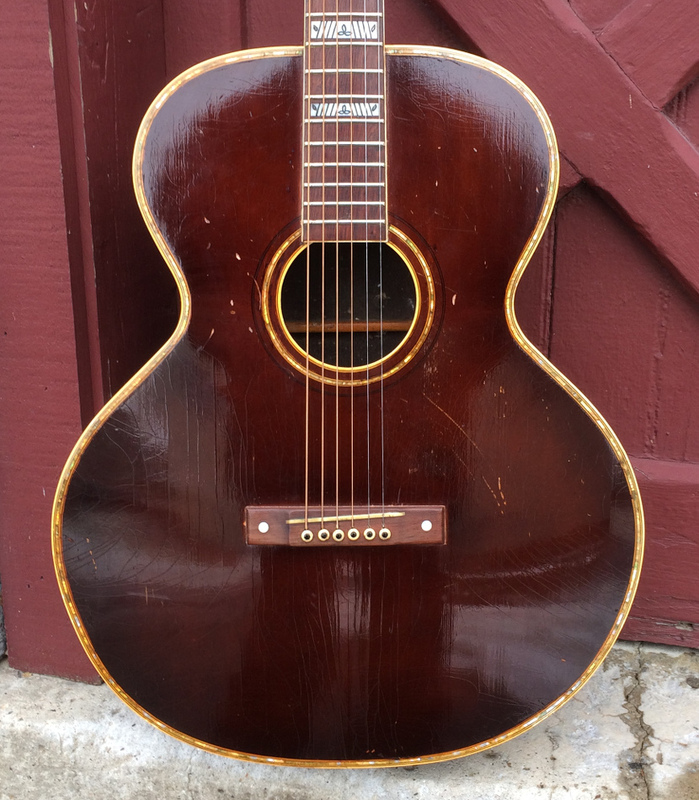 The square-carved neck is mahogany; this guitar is not converted to 'round' neck. The head stock has a plastic overlay with the Bronson name and model name inscribed. The fingerboard is rosewood with engraved position markers and bound in white celluloid. The individual tuners appear original. Scale length is 25 1/2" and the frets appear unused due to the Hawaiian set up, although the nut is shaved down for Spanish playing. The neck measures 1 13/16" at the nut. The guitar has a huge sound with a slide or when played in the lower position Spanish style. All in all, a very rare, beautiful and unique-sounding instrument.